Composition of three interesting trains in the morning: EN 234 Roma Termini to Wien Hbf (night train with car transport), EC 1365 Zürich HB to Graz Hbf (likewise) and EC 172 Villach Hbf to Hamburg-Altona via Praha - Berlin. 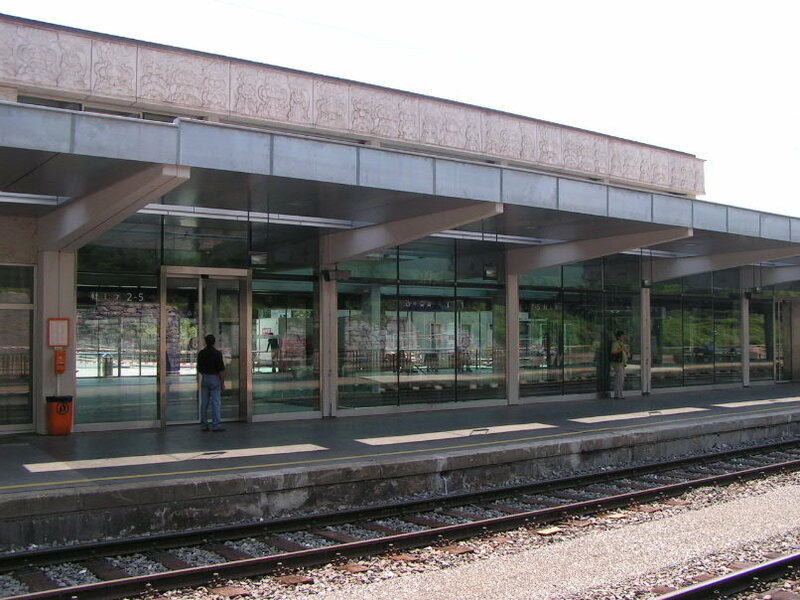 Leoben Hbf, 2014-09-22. 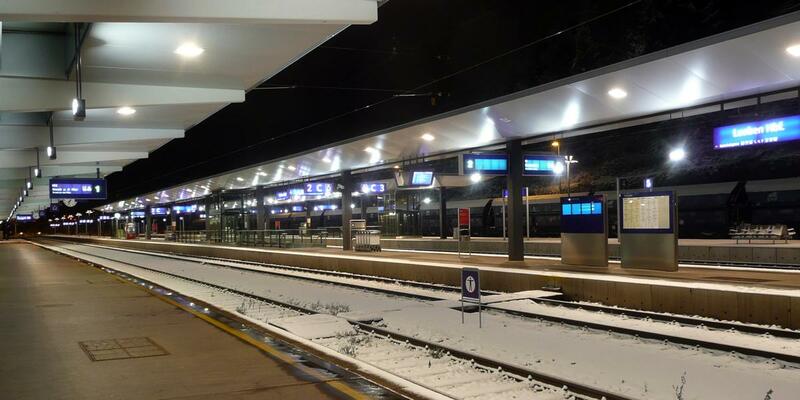 Electronic train composition indicator in Leoben Hbf, showing the EN 1236 "Allegro Rossini" Roma Tiburtina - Wien Meidling, the EN 234 "Allegro Tosca" Roma Termini - Wien Meidling and the EC 172 "Vindobona" Villach - Hamburg Altona. 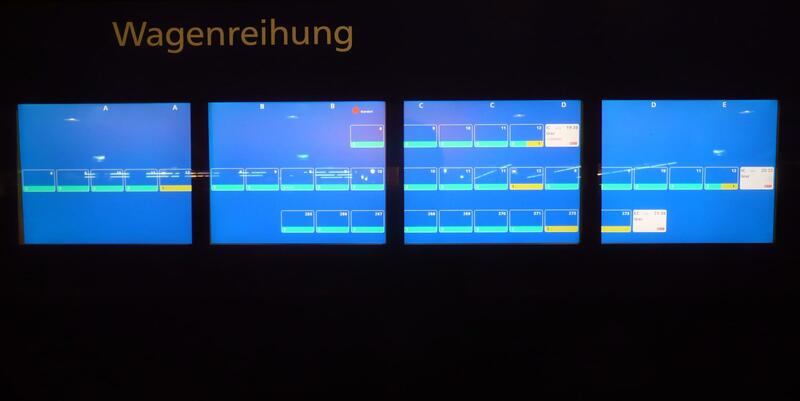 Unfortunately this display does not take any last-minute changes into account and has many mistakes, though it could accurately represent the actual train composition of today if only it was correctly networked with the internal ÖBB systems. 2010-07-04. 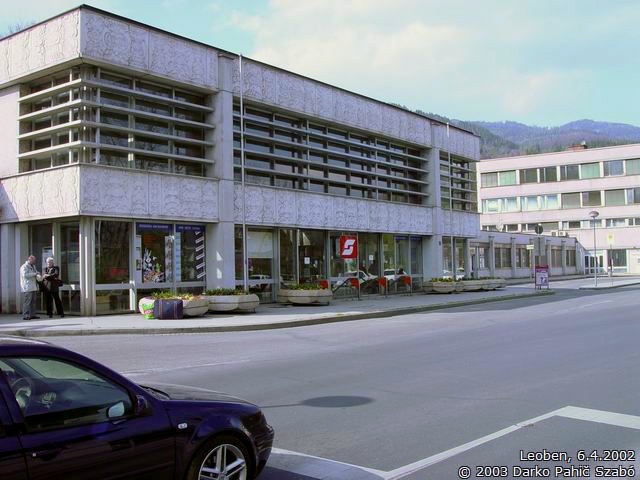 Leoben Hinterberg. This station is mostly used for parking unused RoLa cars currently. 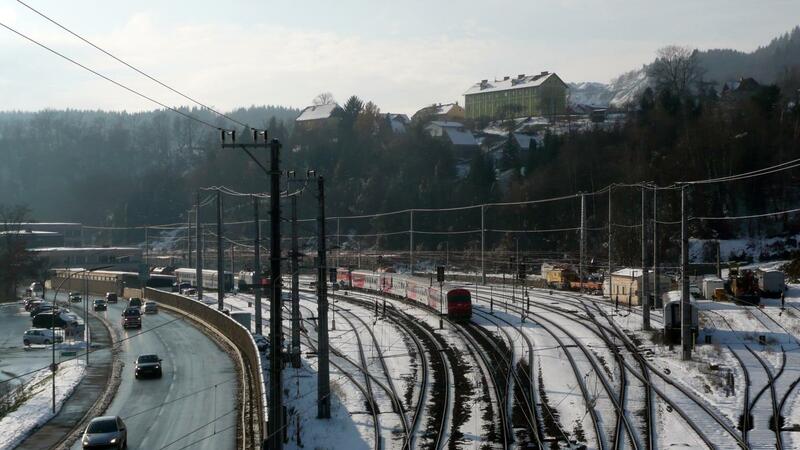 One track is kept open for the case of an emergency in the Galgenbergtunnel, a bypass that has taken all regular traffic from this section. 2012-04-27. 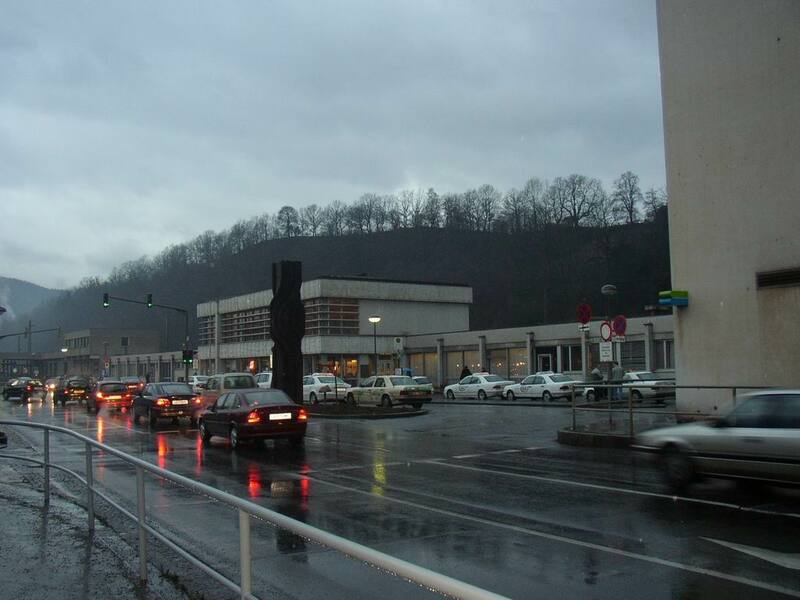 Leoben Hinterberg. 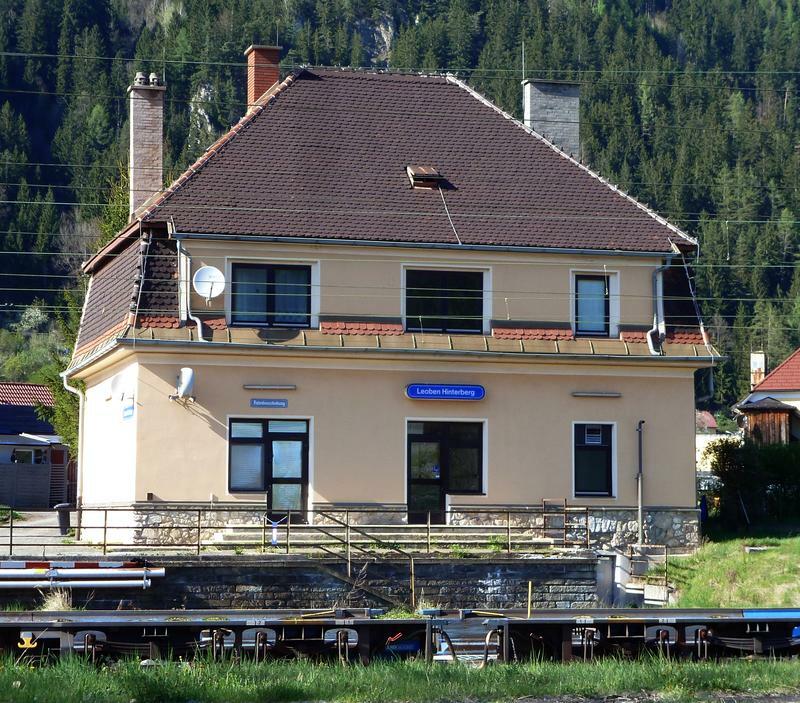 The station building is still there, maybe used for private purposes, but passenger trains aren't running here any more, they take the faster way through the Galgenbergtunnel. 2012-04-27. 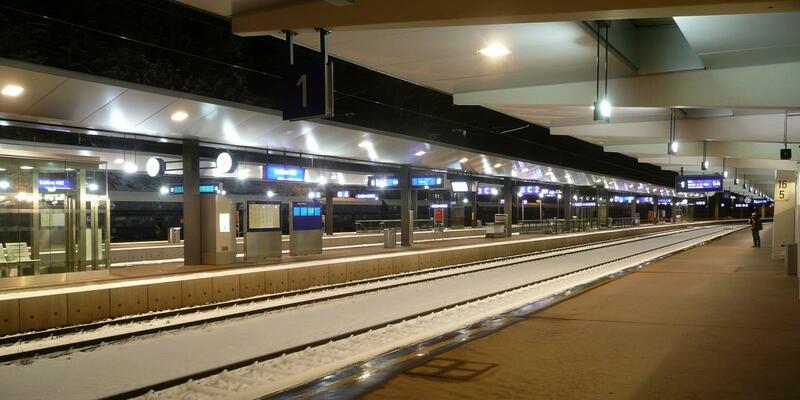 Leoben Hbf, first snow of the season, 2008-11-22. 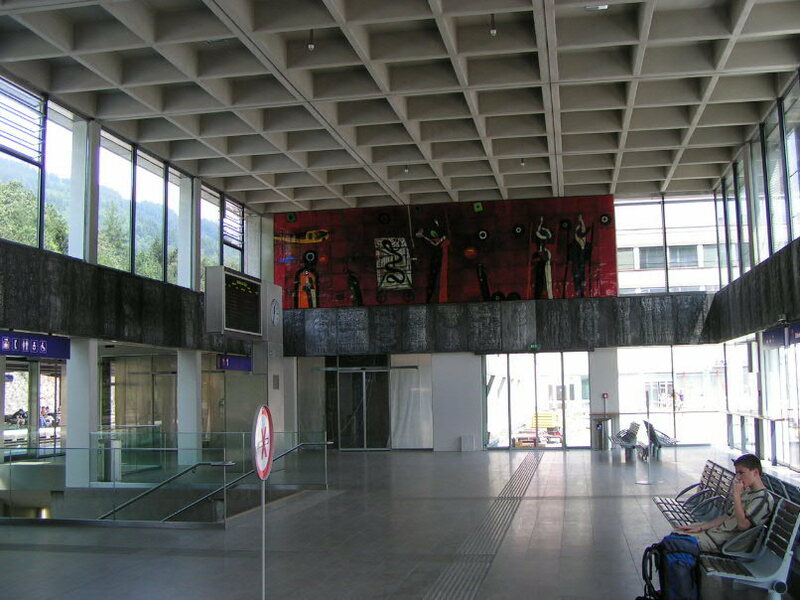 Leoben, 2005-04-29, 20:40. This station is under rebuilding. 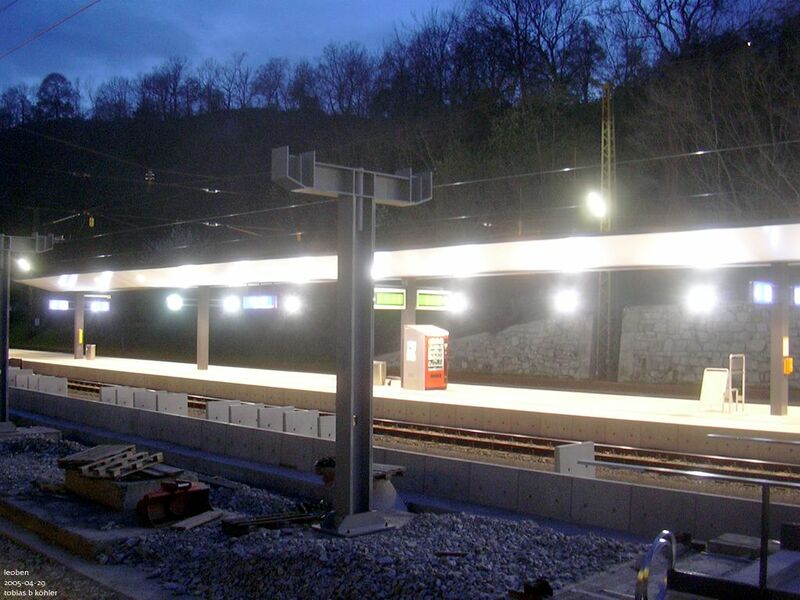 One platform has been finished and is nicely illuminated, the other is still a building site, there the supports for the new roof have just been installed. 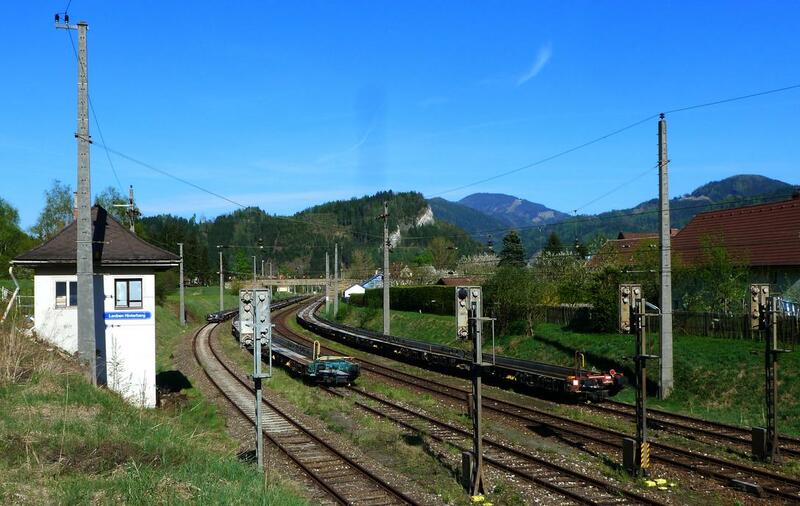 Photo taken out of train IC 613 (Innsbruck - Graz). Display of trains departing 14:27 to 16:41. Leoben, 2015-03-19, 14:19. 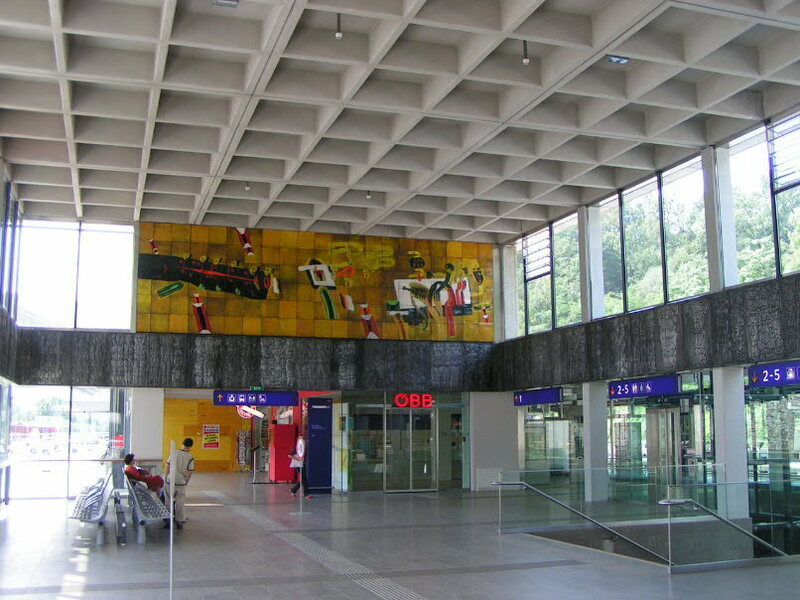 East entrance of Leoben station, 2008-11-29. Guess who's living in the green house on the hill in background? 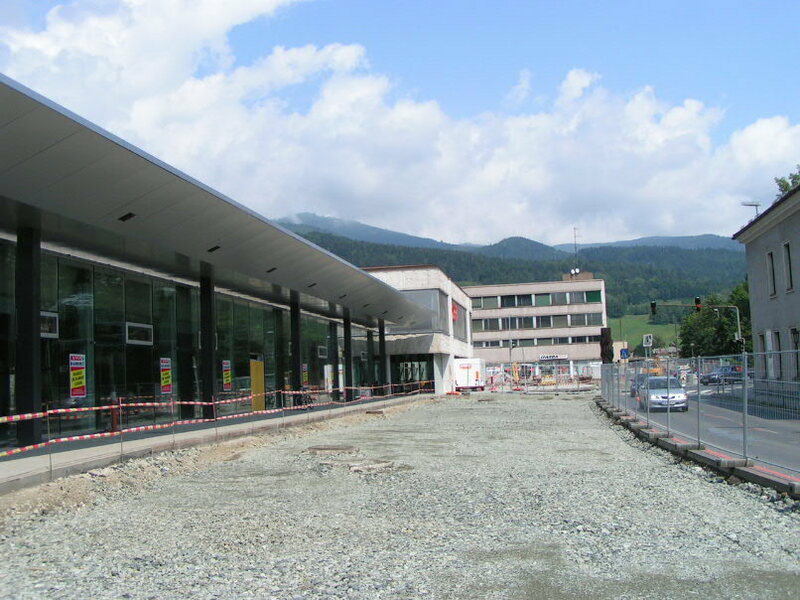 A view towards Leoben Hbf from the west. 2009-12-20. 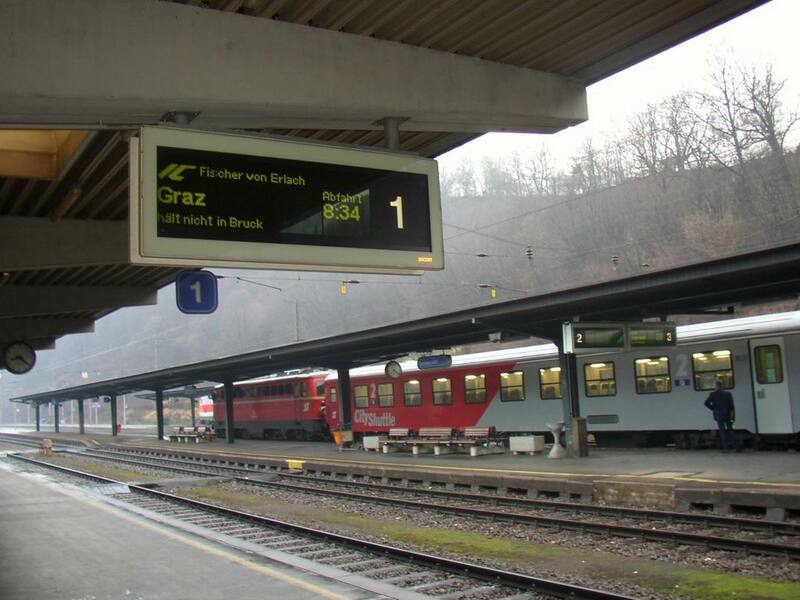 Electronic indicator of train compositions in Leoben (Austria), of the latest technology. 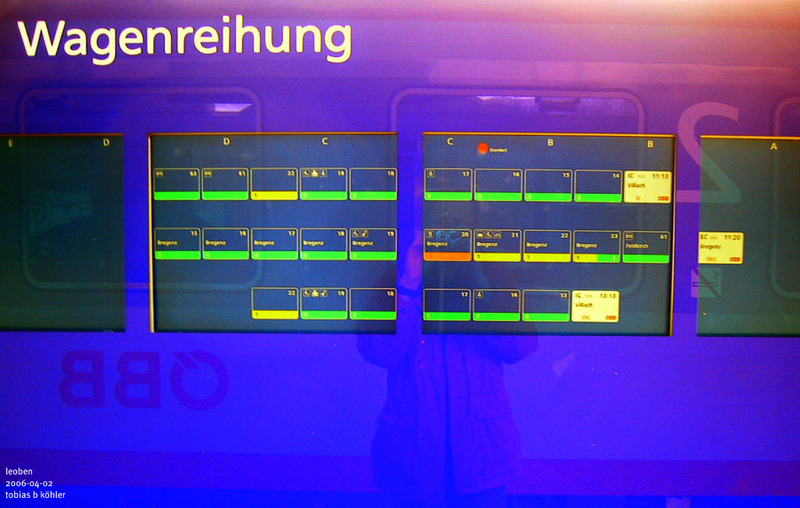 It consists of four TFT displays and shows the composition of the next three trains; the platform is divided into five sections A B C D E, the position of the indicator relative to the train with a red dot. 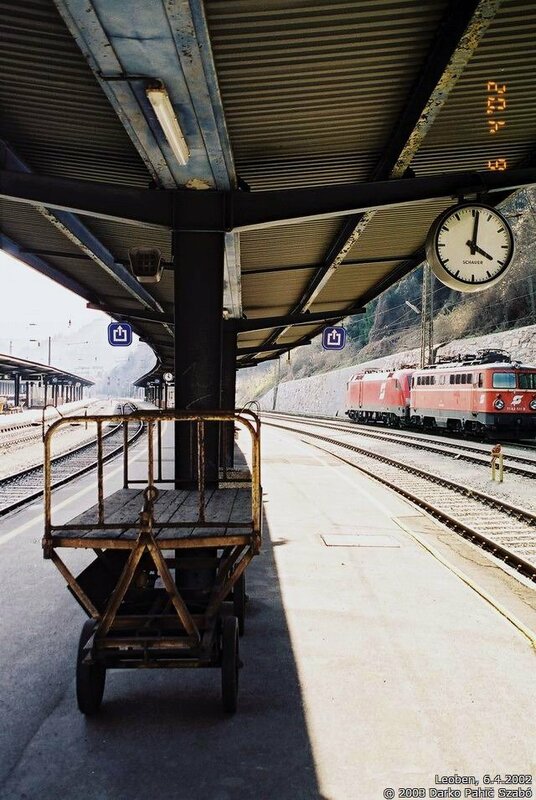 It's hard to take Photos of it in bright sunlight - in the reflection you can see the photographer and a coach of an ÖBB InterCity train. 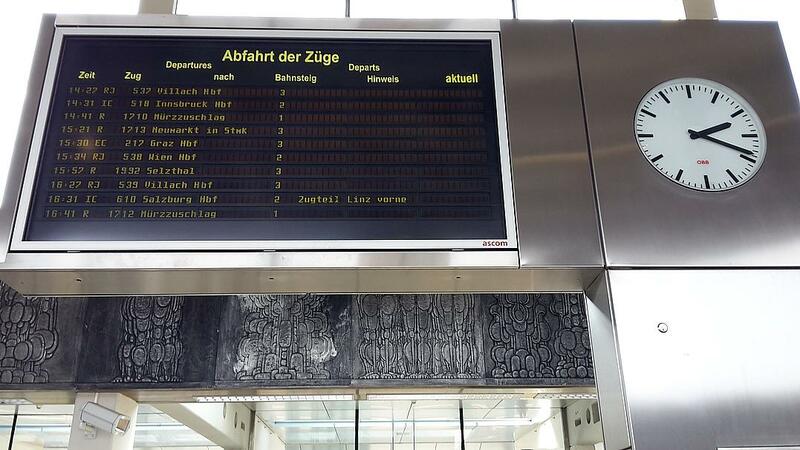 Leoben Hbf has a high tech indicator of train compositions on the platform. 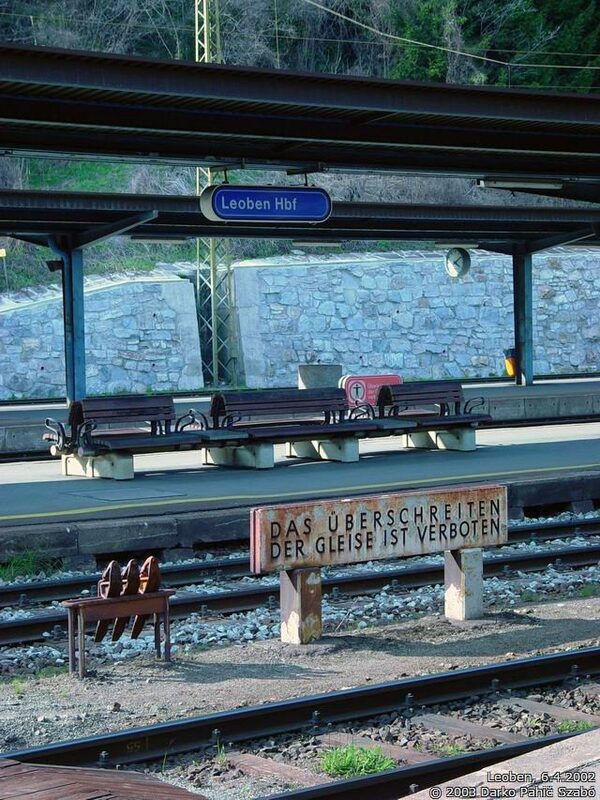 This could be a nice thing, but for some trains it displays pure nonsense. Take IC 601 at 20_22 for example, which is going from Linz to Graz. It is shown here with 19 cars! Including several with identical numbers. In reality the train is much shorter, this was one of the last regular trains with class 6010/7010/7110 cars (4010 units without the power car, pulled by a class 1144), but mostly it is mixed from hired DBAG cars and ÖBB cars, only four or five cars long. 2000-01-23. 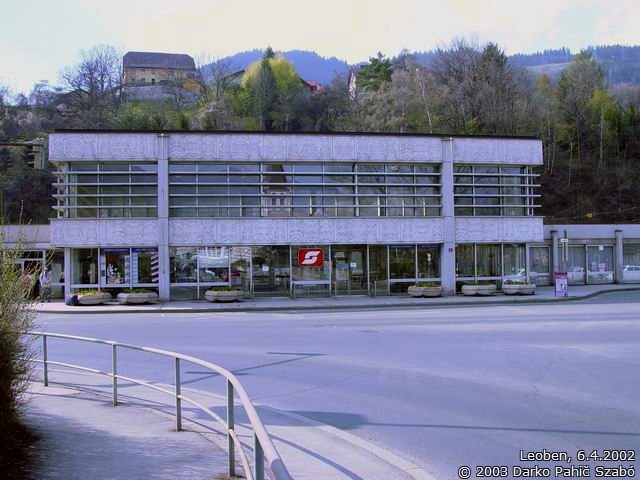 Stellwerk 2, Leoben Göss. 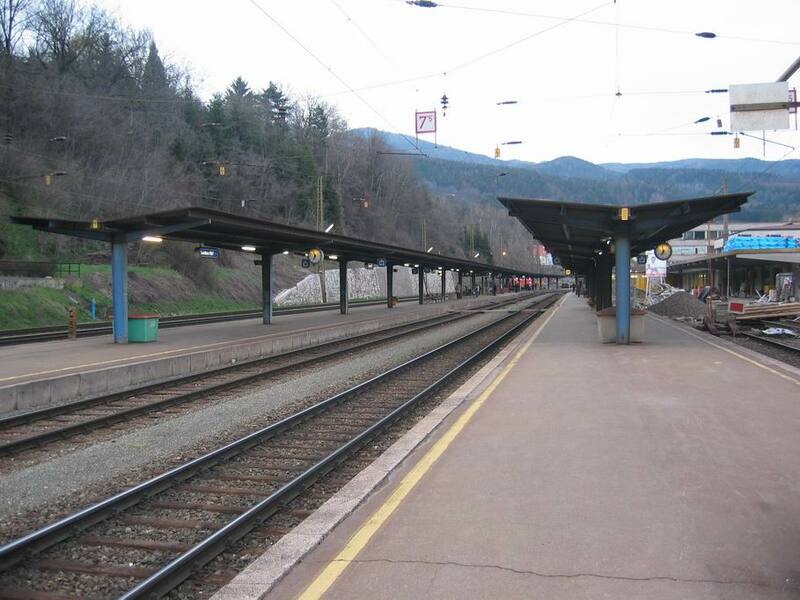 This station on the old line Leoben - St. Michael (replaced by the Galgenbergtunnel) has no regular passenger train service any more, a few freight trains serve the brewery and woodworking industy of Göss. 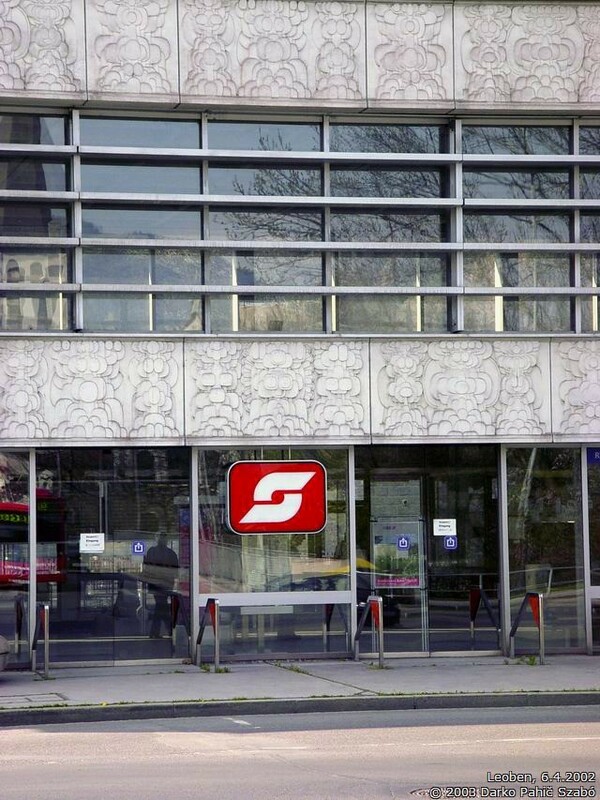 The name "Göss" is typeset in the style of the local brewery. 2009-03-28. 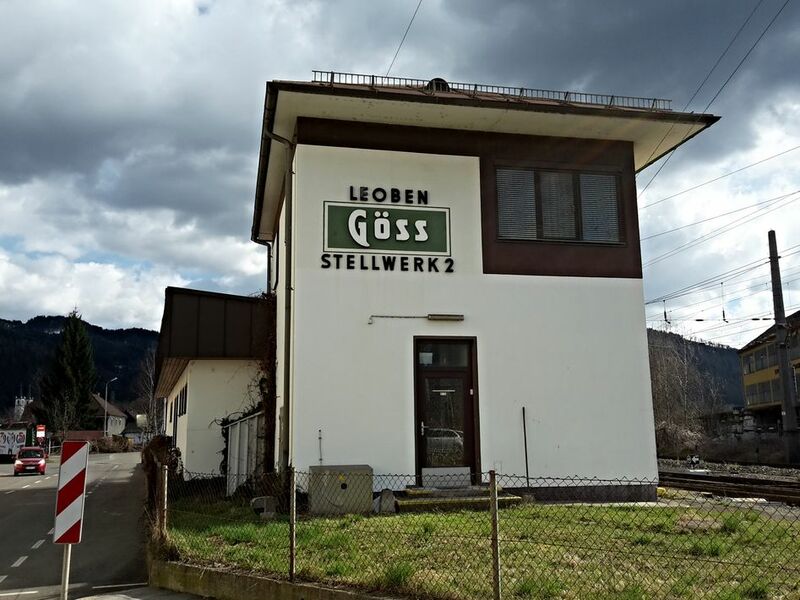 Leoben Göss Stellwerk 2. 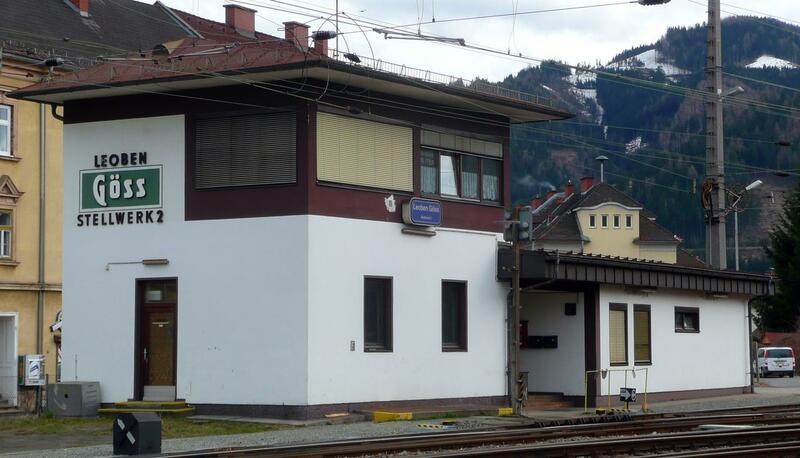 Since all through trains take the Galgenbergtunnel, this station is only used to serve the industrial tracks of Gösser and Mayr-Melnhof Holz. 2015-04-05.